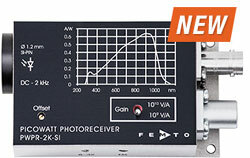 Electro Optical Components Inc.: FEMTO introduces their new picowatt photoreceiver series PWPR-2K with switchable gain (109 V/A, 1010 V/A) and a bandwidth from DC to 2 kHz. It is the perfect choice for cw-measurements, time resolved signal acquisitions and highly sensitive modulated measurements. Other features of the PWPR-2K photoreceiver include ultra-low noise, NEP ≤ 10 fW/√Hz. Si and InGaAs models cover the wavelength range from 320 to 1700 nm. In addition to precise and fast cw-measurements the relatively large bandwidth from DC to 2 kHz also allows time-resolved and modulated measurements. Particularly the combination with lock-in amplifiers results in ultra-sensitive measurement systems being almost immune to disturbances from external sources. In this way the PWPR-2K can easily detect optical powers from about 100 fW up to 10 nW. -Current | -Signal amplification, conditioning, transmission | -Electrical and magnetic | -Data acquisition, Conditioning, Visualization | -Amplifiers | All articles | Electro Optical Components, Inc.